Back on April 26th, 2011 Girls Names released their debut album 'Dead To Me' on the Slumberland Label. A couple of months later I am finally getting my chance to listen to this little band that hail from Belfast. 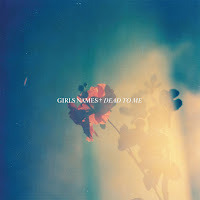 The recordings for 'Dead To Me' began at the end of 2010, and the band entering the studio with the conscious desire to make an old-fashioned style pop album, with a little mix of goth in there as well. My first impressions when I heard their sound was "this is really good". It is almost as if this is a lofi/indie rock album of 2011 that got lost in the shuffle. 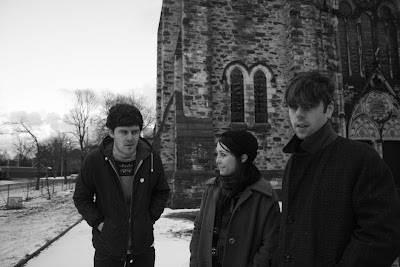 With the emergence of Yuck and Smith Westerns - Girls Names some how got lost in the mix. As for me I actually preferred 'Dead To Me' over both offerings of the critics LoFi kings of the the year. Girls Names give you 10 very good songs that attract the ears. The opening song 'Lawrence' is a mix of indie sounds at its best. Some other very good songs include 'When You Cry', 'I Lose' and the heavy 60's sounding 'No More Words'. Their genre of music could be classified as a mix of indie/shoegaze/lofi/pop/goth. They use guitars chiming in over fierce sounding vocals as their bread and butter sound. This is an overall very consistent and underrated record giving us 10 songs that all work well together.